This is the less common type, affecting mostly young people below the age of 40. In general, it accounts for about 10% of all diabetes cases. In Type 1 diabetes, the pancreas cannot produce the hormone insulin at all. Many children and teens who have this inherited it from their parents. 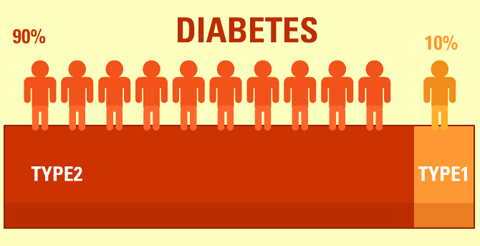 It is the most common type of diabetes, affecting mostly people 40 years and above. It accounts for about 90% of all diabetes cases. In Type2 Diabetes, even though the pancreas can produce the hormone insulin, it does not produce enough. In some cases too, the body becomes resistant to the hormone and does not “regard” the work it does. This means the cells fail to use the insulin properly for the benefit of the body. There is also a third type of diabetes called gestational diabetes. Although not common, it occurs when pregnant women who have never had diabetes develop a high blood sugar level. This type often ends up in Type2 diabetes. Diabetes can be fatal if left untreated. It can result in many health complications such as heart disease, stroke, nerve damage and blindness. Note that people who are diagnosed with diabetes can take their medicines and live normal lives. They can do anything that diabetes-free people do, including sports, and high action jobs. It is always important that you get clearance from your doctor first; just to be sure you are OK to do anything.